Living, walking, breathing brews, 1990s. 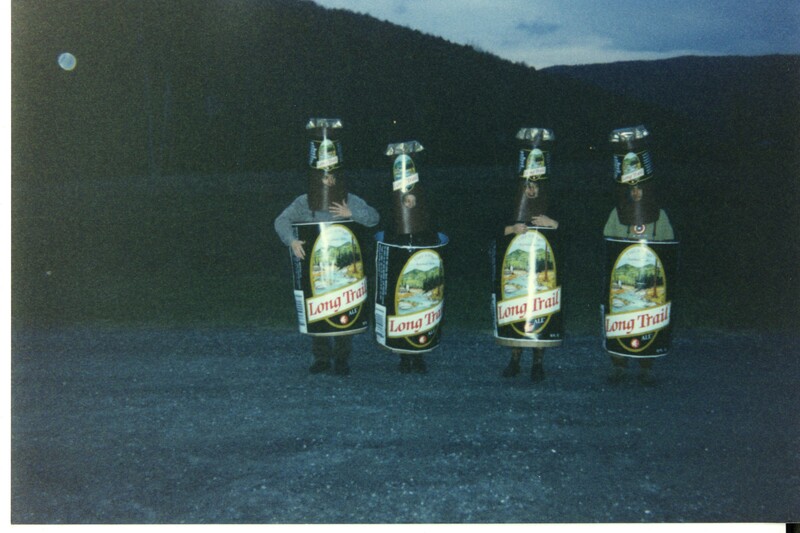 This weekend, Long Trail Brewing Company will celebrate its 25th anniversary. For this week's feature, Seven Days caught up with longtime brewery employees Dave Hartmann (brewmaster), Billy Gault (facility manager) and Matt Quinlan (operations manager), as well as members of the marketing team and a few other industry folks. They had a lot to remember, far too much for the 1500-word feature that ran in the paper this week. Below, more excerpts from our hours-long interview. Matt Quinlan, operations manager: We didn’t employ a brewmaster at the time; we did a lot of that work [brewing, coming up with recipes, etc.] by committee for a long, long time. BG: We gave [the equipment] incredible pet names: the "Goat Milker," which was a refrigeration unit that we retrofitted — the "Watch Battery," the "Mojo," the "Zero." MQ: People would join the brewery and we would be talking in code, basically. BG: We would go into these old farms and milkhouses that were abandoned and take these old milk tanks out of them and retrofit them and put cooling lines in them and do our own fabrication. …We were doing whatever we could to save a buck to take that next step and buy some new awesome piece of equipment. We were eating peanut butter and jelly sandwiches every day. Jed Nelson, marketing director: Today you can just go look at a catalog and buy a whole brewery. The brewery was hand crafted. There wasn’t a blueprint for this stuff. On expansion, past and future. MQ: Early on, the intention was to brew these beers locally as alternatives to imports. It was about small and local. … The change in scale is interesting; we’re producing 130,000 barrels a year now. During the 1990s we would have been like, "That’s HUGE. We’ll never be anywhere near that." We just couldn’t think at that scale. … Eventually we expanded throughout New England, and there was this call to go even further. There still is. At some point we started to think, This is getting away from the original vision — this isn’t local anymore. … Nowadays it’s easier to contemplate [shipping farther] — the ingredients are better, the equipment’s better; you feel confident that the beer’s going to be good. 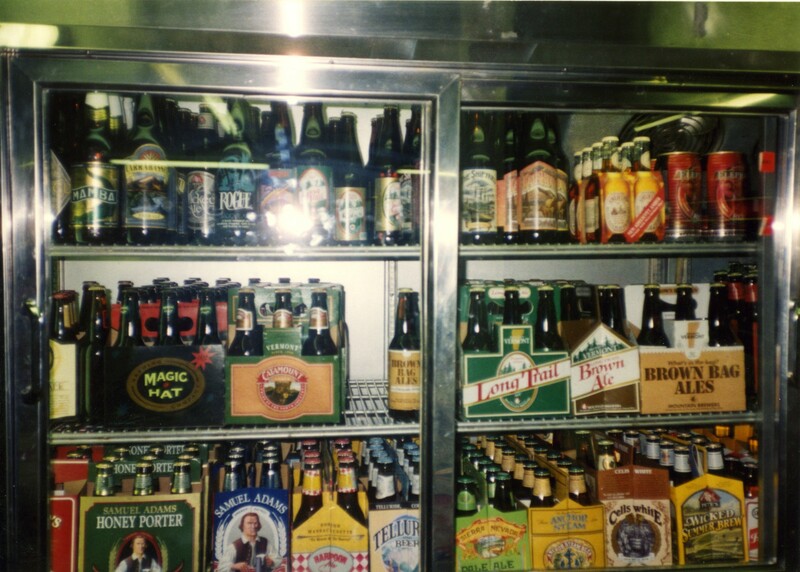 I don’t know if the beer we were making in 1995 would have made it to California. … A lot of craft brewers are shipping to Europe now. It’s crazy. So in terms of the next 25 years, there’s a lot to think about in terms of growing the business … Just because we can ship to California doesn’t mean we should ship to California. … Our growth has always been slow and steady. These decisions are not taken lightly. … Andy saw what Sierra Nevada and Red Hook and some guys on the West Coast were doing; he thought he could do that and compete with the foreign beers. Bass Ale and, like, Amstel Light; beers like that were the target. DH: I don’t know that [Andy] was really looking to create something new, but he saw a market for these [import-style] beers and thought, I can do this locally, and they’re all the way overseas and their beer isn’t fresh. … It just continued to evolve. No one expected that there would be this huge explosion of styles and new beers, or that people were going to start unearthing recipes from the pyramids and all the crazy stuff that followed. 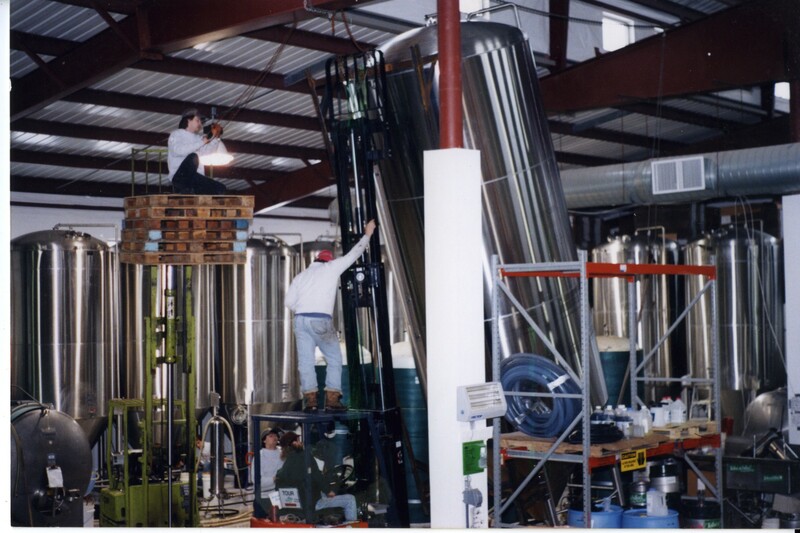 Installing equipment at the new brewery, mid-1990s. MQ: Right before we were scheduled to move into [the new brewery, in 1995], we were in the middle of a string of record months for production. It was right before Thanksgiving. … We would empty a tank down the street and we wouldn’t even wash it. We’d just disconnect [the tank at the old brewery], throw it on the back of a truck, drop it over here. I’d be washing it out and Billy would be frantically attaching the refrigeration plumbing and the controls, because within two hours there would be wort coming out of the brewhouse to fill it. Those are not exaggerations. MQ: We were working 24/7 for weeks. I remember going home to get, like, three hours of sleep. BG: With the waves of new people getting into the industry, there’s some really bad beer out there. But the good ones keep prevailing. MQ: Younger brewers are making these [strange styles], and they think we’ve never heard of this stuff and that they’re breaking ground. We did that in 1995. I don’t say that condescendingly, but just, like, we did it; we’re over it. DH: That early work of getting out there and convincing people that beer can be something besides this yellow fizzy beer was hard work. The guys who are starting out now and who are tiny don’t even have to worry about that. … I give the newer guys a lot of credit, and they’re doing a lot of creative stuff. DH: People don’t expect us [to play around with things that much]. We did a smoked beer and it was very smoky; people were very surprised by how smoky it was. It was a pretty small release. Some people thought it was awesome — but we also heard a lot of negative, like "What are you doing?" SEVEN DAYS: Do you enjoy experimenting with weird ingredients? I see dudes brewing beer with herbs and pine needles — things like that. DH: Is adding pine needles and things like that to beer that fun? Yes, it is. It’s pretty cool and it’s challenging, but I’m a little bit concerned that it’ll go too far. … It sort of feels like people are throwing whatever in[to the beer] — to some extent — just to stick out. There are so many breweries out there. You start to feel like I have to stand out by doing something really out there. … As long as it adds to the beers getting better, it’s great. I wonder how far it’s going to go. SD: What kinds of experiments get your creative juices flowing in the brewhouse? DH: I’m really intrigued by new varieties of hops, new flavors of malt, things you can get now that didn’t even exist before. Those basic raw materials — hops and malt and yeast — are so much better now than when we started. And a lot of those are really enough to concoct these amazing beers. … Doing pretty basic things is pretty cool as well. JD: We keep the brands separate. There’s definitely a lot of crossover; we share marketing and finance staffs, but our production and brew staffs are completely separate. … They each really have their own identities and space and teams. Those guys design their beers and we design our beers. DH: We make some of our beers up there [at the Otter Creek Brewery]; that's about what it amounts to, in terms of brewing. JD: Dave and Mike [Gerhart, brewmaster at Otter Creek] have completely different personalities. We really want to bring out the best of Dave and the best of Mike. BG: We were the only ones with power, so we fed the whole town for a week. We were ground zero. The town of Rochester was totally cut off; we rented helicopters and flew in water and diapers and food. This was a basic triage facility where people could come in and get a hot meal and dry off a bit and charge their cellphones. MQ: It was a week before I got back home. There was a ton of work to do here, to put the brewery back together; the National Guard was staging here, dropping supplies in the field. … People emptied out their fridges and freezers because they didn’t have electricity and brought it [the food] down here, and we cooked everything and had community dinners for a couple days. DH: — And someone would go by on a horse. MQ: There were no cars, and destruction all around. It was surreal. DH: I didn’t realize anyone was growing corn upstream, but somebody was. There were corncobs everywhere, washed downstream. And the debris. It was a scavenger hunt for a while. Like, "Oh, look at this, it’s a — I don’t know what it is." Everything was destroyed west of the brewery. SD: This has been burning in my soul since 2002. Did you change the recipe for Blackbeary Wheat at some point? I remember being at a party drinking that beer one night, and my friend said it tasted different and that he’d heard you’d changed the recipe. DH: We get questions like that not infrequently. But no, we didn’t change the recipe or the beer at all. We just changed the labels. The label changed, and I think people’s perceptions change.